Subqueries and derived tables can add great versatility to SQL statements, cut down complexity, but can occasionally be a curse when their effect on performance is poorly understood. Surely everyone understands the various types of subqueries and how they are used? If you felt a twinge of doubt, here is Rob Sheldon's easy guide to the subject. Few elements within a Transact-SQL statement are as versatile as the subquery. A subquery-also referred to as an inner query or inner select-is a SELECT statement embedded within a data manipulation language (DML) statement or nested within another subquery. You can use subqueries in SELECT, INSERT, UPDATE, and DELETE statements wherever expressions are allowed. For instance, you can use a subquery as one of the column expressions in a SELECT list or as a table expression in the FROM clause. You must enclose a subquery in parenthesis. A subquery must include a SELECT clause and a FROM clause. A subquery can include optional WHERE, GROUP BY, and HAVING clauses. A subquery cannot include COMPUTE or FOR BROWSE clauses. You can include an ORDER BY clause only when a TOP clause is included. NOTE: Microsoft documentation states that subqueries perform about the same as statements that are semantically equivalent, such as subqueries and joins. However, if existence must be checked (as will be described later in the article), a join often performs better if the subquery must be processed for each row returned by the outer query. Notice I’ve inserted the subquery as the fourth column expression in the SELECT list and named the column TotalQuantity. The subquery itself is enclosed in parentheses and made up of a single SELECT statement. The statement retrieves the total number of items sold for sales order 43659. Because there are multiple line items in this order, I used the SUM aggregate function to add the numbers together and return a single value. The following table shows the result set returned by the outer SELECT statement. As the results show, the outer SELECT statement returns a single row from the SalesOrderHeader table for order 43659, and the TotalQuantity column itself returns a value of 26. If you were to run the subquery’s SELECT statement on its own (without running the outer query), you would also receive a value of 26. However, by running the SELECT statement as a subquery within the outer SELECT statement, the total number of items sold is now provided as part of the order information. I’ve included the CASE expression as part of the fourth column expression. The CASE expression uses the subquery to total the line item sales in the SalesOrderDetail table for order 43659. Notice that, as in the preceding example, the subquery is enclosed in parentheses and uses the SUM aggregate function to return a single value. I then use an equal (=) operator to compare the subquery’s result to the SubTotal column in the SalesOrderHeader table. If the amounts are equal, the CASE expression returns a value of balanced. It the values are not equal, CASE returns not balanced. The following table shows the results returned by the outer SELECT statement. As you can see, the line item sales total in the SalesOrderDetail table does not match the subtotal in the SalesOrderHeader table, at least not for sale 43659. However, suppose you want to verify all the sales listed in the two tables to see whether the totals balance. To do so, you must modify both the subquery and the outer query in order to create the condition necessary to support a correlated subquery. A correlated subquery, also known as a repeating subquery, is one that depends on the outer query for specific values. This is particularly important if your outer query returns multiple rows. As before, the CASE expression includes a subquery that returns the total amount for line item sales. However, notice that the subquery’s WHERE clause is different from the previous example. Instead of specifying an order ID, the WHERE clause references the SalesOrderID column from the outer query. I do this by using table aliases to distinguish the two columns-h for SalesOrderHeader and d for SalesOrderDetail-and then specifying that the column values must be equal for the WHERE condition to evaluate to true. That means that, for each row in the SalesOrderHeader table returned by the outer query, the SalesOrderID value associated with that row is plugged into the subquery and compared with the SalesOrderID value of the SalesOrderDetail table. As a result, the subquery is executed for each row returned by the outer query. The value returned by the subquery is then compared to the SubTotal column of the SalesOrderHeader table and a value for the LineTotals column is provided, a process repeated for each row. The following table provides a sample of the data returned by the outer query. As you can see, some of the totals balance out, and others do not. Again, the important thing to keep in mind with correlated subqueries is that the subquery is executed for each row returned by the outer query. The correlated subquery then uses a value supplied by the outer query to return its results. For more details about correlated subqueries, see the topic “Correlated Subqueries” in SQL Server Books Online. The first thing to notice is that the subquery returns a derived table that includes two columns and multiple rows. Because the subquery returns a table, I can join that table, which I’ve named ps, to the results from the Product table (p). As the join demonstrates, you treat a subquery used in the FROM clause just as you would treat any table. I could have just as easily created a view or temporary table-or even added a regular table to the database-that accesses the same data as that available through the subquery. I defined the join based on the subcategory ID in the derived table and Product table. I was then able to include columns from both these tables in the SELECT list, as I would any type of join. The following table shows a subset of the results returned by the outer query. As you can see, the results include the subcategory names, which are taken from the derived table returned by the subquery. Because I was able to join the Product table to the derived table, I was able to match the subcategory names to the product names in the outer query’s result set. The subquery retrieves the BusinessEntityID value from the Employee table for the employee whose national ID is 895209680. The BusinessEntityID value from the subquery is then compared to the BusinessEntityID value in the Person table. If the two values are equal, the row is returned, as shown in the following results. In the subquery, I use the AVG aggregate function to find the average sales quota figure. This way, the subquery returns only one value. I can then compare that value to the SalesQuota column. If the SalesQuota figure is greater than the average, the WHERE expression evaluates to true, and the row is returned by the outer query. Otherwise, the expression evaluates to false and the row is not returned. As the following table shows, only three rows have a SalesQuota value greater than the average. ALL: The column value is compared to all values returned by the subquery. ANY: The column value is compared to the one most applicable distinct value. SOME: The ISO equivalent to ANY. In this case, the subquery returns a list of values, rather than one value. I can return a list because I’m using the ANY modifier. As a result, the SalesQuota value for each row returned must be greater than any of the values returned by the subquery. In other words, as long as the SalesQuota value exceeds any one value returned by the subquery, that row is returned. As the following results indicate, only three rows in the SalesPerson table have SalesQuota values that exceed at least one of the values returned by the subquery. Because I’ve used the ALL modifier, each row returned must have a SalesQuota value that exceeds all the values returned by the subquery. In other words, the SalesQuota value must exceed the highest value returned by the subquery. As it turns out, no row has a SalesQuota value that exceeds all the values returned by the subquery, so the statement now returns no rows. This statement is exactly the same as the preceding example except for the use of the NOT IN operator, but the results are quite different. Rather than returning 14 rows, one for each sales representative, the statement now returns nearly 20,000 rows, one for each person who is not a sales representative. For each row returned by the outer query, the existence of a row returned by the correlated subquery is checked. If a row is returned by the subquery, the existence test evaluates to true, and the outer query’s row is included in the result set. The following table shows a partial list of the results returned by the outer query, after checking for existence. For each row included in the results, the existence test evaluated to true. In other words, the returned rows are part of the Mountain Bikes subcategory. Now the statement returns only those rows that are not part of the Mountain Bikes subcategory. Any row whose existence test returns a true is not included in the results. As the examples in the article demonstrate, subqueries are a flexible and versatile tool. You can define them wherever an expression is allowed in a SELECT, INSERT, UPDATE, or DELETE statement. You can then use the data returned by the subquery in your outer query to make those statements more powerful and ultimately more useful to your various applications. For more information about subqueries, see the topic “Subquery Fundamentals” as well as other topics that address how to use subqueries in SQL Server Books Online. 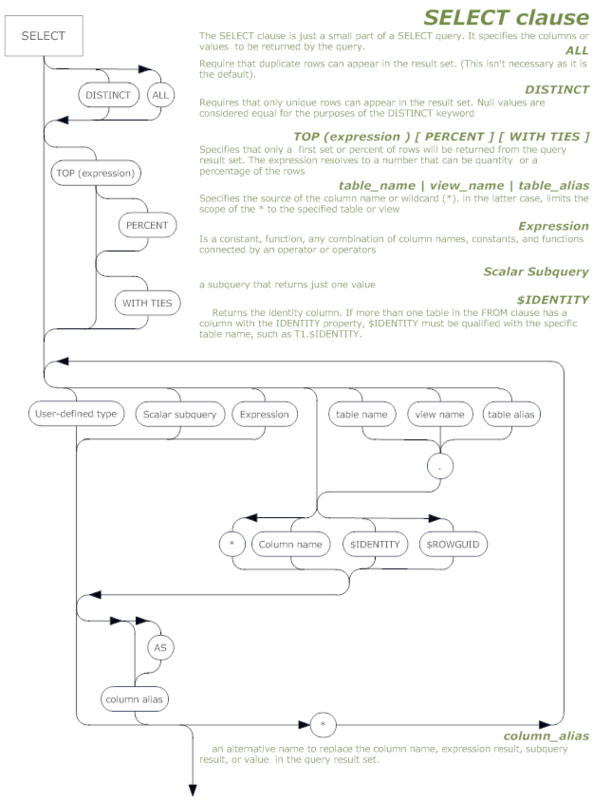 The Select clause, showing how scalar subqueries can be used within them (A full-size PDF version is available in the downloads below. After the brief message that the effect on performance needs to be understood there was no information on performance, which made the article not too useful. although performance part was not covered, from my experience it is good some where and bad some where…Use it with a caution but when it comes to cross database queries, it gives a good performence with derived table or in above subquery in from clause (specially if the data is too big). The performance issues will need to be a separate article, but Robert explains about the correlated subquery ‘As a result, the subquery is executed for each row returned by the outer query.’ The use of a derived table can speed up a query if it avoids a second pass through a large table. The use of a subquery in a WHERE clause can be faster than the equivalent join. To explain the detail and qualifications of all this in an introductory article about subqueries would be reckless, but it might make an interesting separate article. Apoologies if the ‘blurb’ misled readers into expecting an article on the performance of subqueries! Yeah, as noted by someone else, I was really reading this in the hope of learning more about the impact of subqueries on the performance. I was looking for guidelines on when and where to use subqueries. I already knew most of what was in this article. I was floored upon recently discovering this, but in fact (in TSQL at least), "FROM" is *not* required in a subquery. You can refer to columns from the outer query without mentioning a FROM. For the example at the top of your article, is it possible to filter ‘balanced’ or ‘not balanced’ from the result set since that column is coded from a subquery? can any one tell me why i cannot get any results back please? You have used a fairly complicated way of doing this. In your case the query doesn’t return anything because the highest salery is not in department D01, which means the subquery in the where clause returns the maximum salary from another department, which isn’t found in your department. You probably figured this out already, but I thought to weigh in anyway. in case someone else stumbles over it. Yes you can, but not in the original query, you cannot put a scalar subquery in a where clause. If you put the query in a subquery, or CTE however, you can then filter the results. I’m trying to add a count function into a sub query and am having some difficulties with adding a count function. Here is the question and what I’ve written already. b. Do any drivers use more than one bus on their run where the Bid Date is in September 2004? Now I have the grouping right but how do I do a count of drivers who drive multiple busses?